HL-L5100DN is a cost efficient, Monochrome Laser Printer that is ideal for sharing across busy offices or small workgroups with its built in Ethernet network connectivity. Its high print speed of up to 40ppm and automatic 2-sided printing also helps improve user’s efficiency and the optional super high yield toner reduces printing cost. 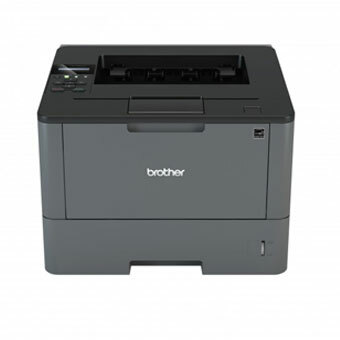 Reduce paper and toner wastage with Brother’s duplex (two-sided) printing and optional super high-yield toner which effectively reduce total operating costs and lower your overall cost per print. Plus, easily produce 2-up and 4-up on a single sheet. This saves paper when viewing drafts or layouts. Featuring high print speed of 40/42ppm, users can save time when performing large volume printing tasks. They can utilise their time more efficiently instead of waiting for their printouts. With the free iPrint&Scan app, you can now print, scan, preview copy and fax directly from your andriod or iOS mobile devices. You can print directly from your Apple devices without any applications. Simply access your document and print via iOS built in function, AirPrint.